I once read that the 3rd Monday of January is supposed to be the most depressing day of the year – Blue Monday. I don’t know if it’s true, luckily it has already passed, and I didn’t notice my mood drooping drastically that day. However, I’ve felt a rising impatience for more light and warmer weather to come back into my life. So much so that I had to book flights to Malta last night. This always makes me feel so much better, no matter how far in the future the departure date lies, just the thought of it puts me in a good mood. Another way to lift my spirits is food. Cosy food, colourful food, or simply delicious food. 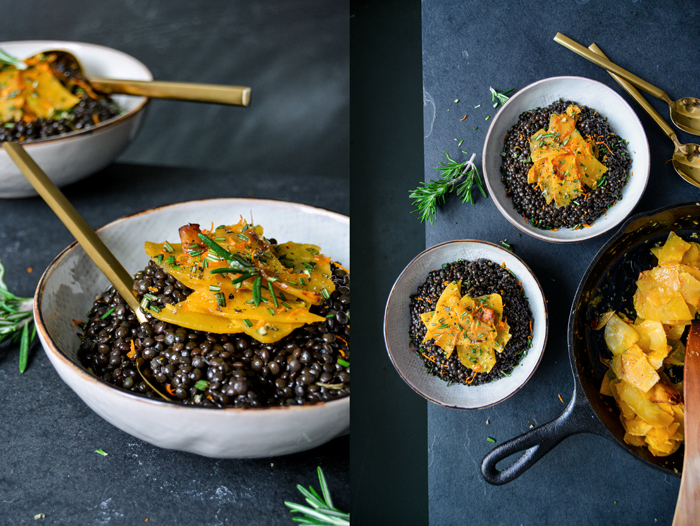 This dish combines all of it: nutty Beluga lentils, topped with thin slices of rutabaga, quickly cooked in the pan with lots of ginger, orange zest and juice, and fresh rosemary. The rustic root is as bright as the sunrise over Malta’s east coast and its earthy flavour can easily deal with some strong aromas. I was surprised how well it merged with the dark legumes. 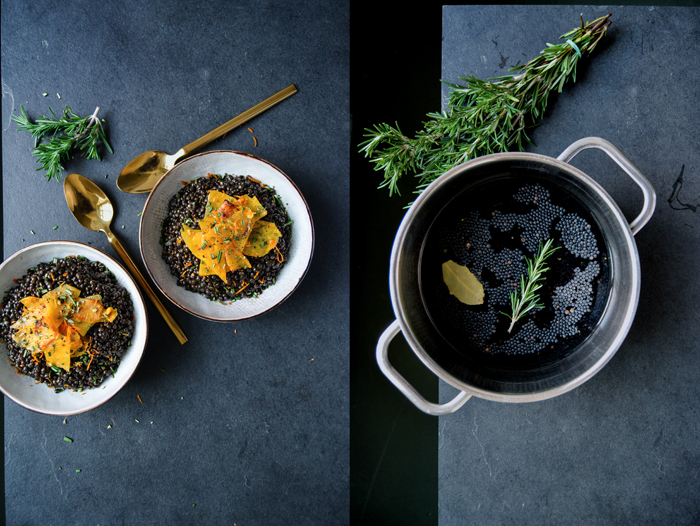 Place the lentils in a saucepan with plenty of (unsalted) water, add the rosemary and bay leaf, and bring to the boil. Simmer for about 20 minutes or until al dente (or follow the package instructions). Remove excess liquid with a ladle if necessary and stir in a generous splash of olive oil and the vinegar. Season to taste with salt, pepper and vinegar. 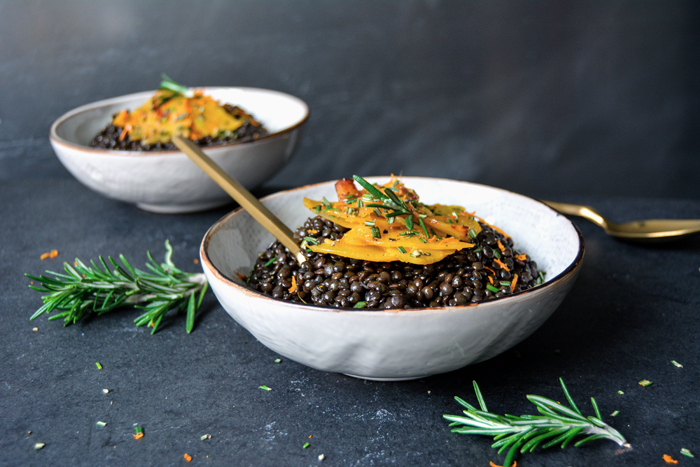 While the lentils are cooking, prepare the rutabaga: In a large, heavy pan, heat a generous splash of olive oil over medium-high heat. Add the rutabaga and cook for about 5 minutes, stirring occasionally, until golden and al dente. Scrape the rutabaga to the side, add a little more olive oil to the pan along with the ginger, cook for 1 minute, stirring constantly. Add the orange zest (leave a little of the zest for the topping) and juice and season with salt and pepper. Stir in the rosemary or use as a topping once the plates are ready. Cook for another 1-2 minutes until the desired texture is reached. 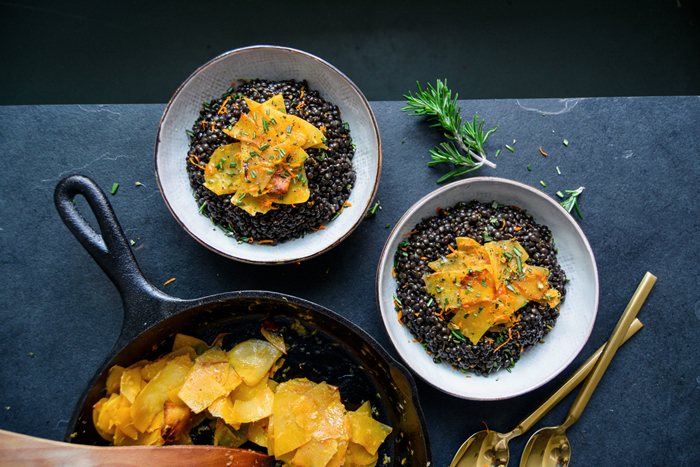 Divide the lentils between plates and lay the rutabaga on top. 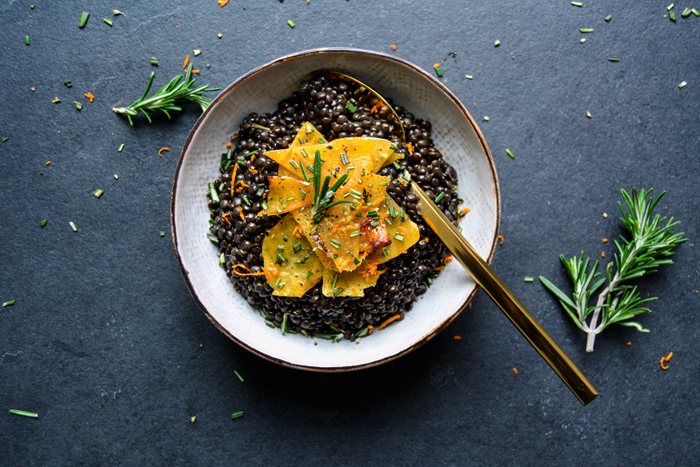 Sprinkle with rosemary, orange zest, and crushed peppercorns and drizzle with a little olive oil (optional). Serve immediately. 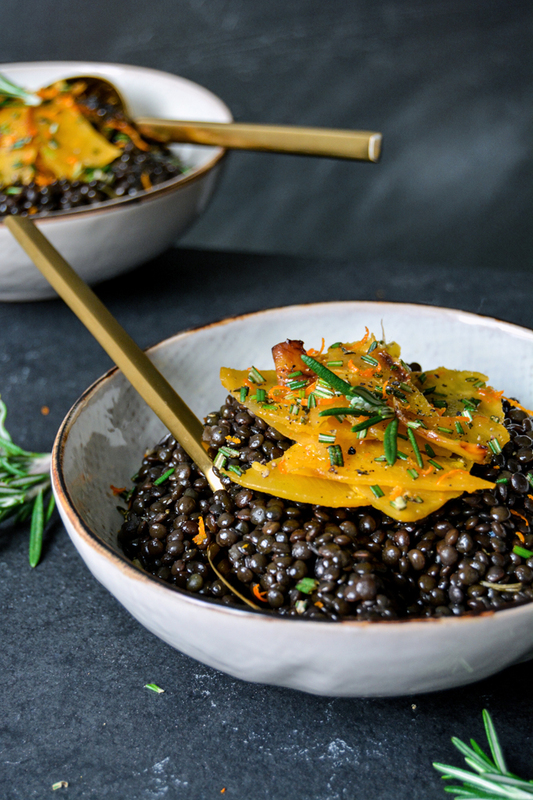 I love lentils and rutabaga so this is a dish I will be trying. 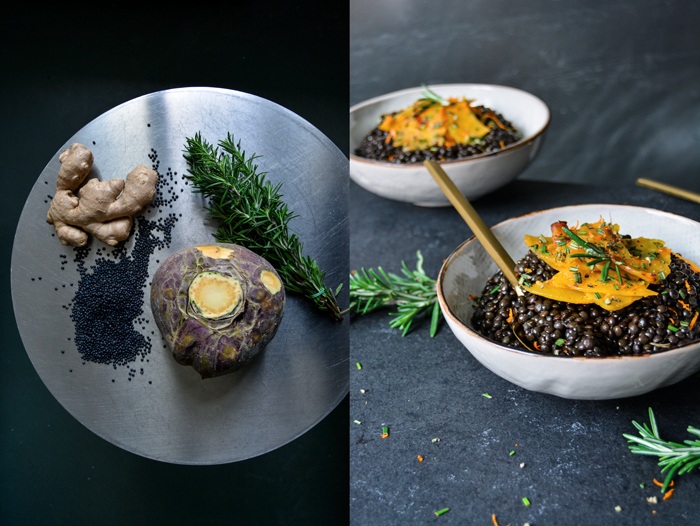 I am anxious to try the rutabaga recipe…it will be nice to have them some way other than boiling or oven roasted.